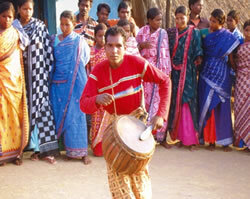 In Odisha, the Kandha is numerically the most populous tribe. Their main concentration is in South Odisha. The population of Kandha in Odisha is 16.27 lakh as per 2011 census. In undivided Koraput district the population of Kandha is 6.58 lakh and in Nabarangpur district they number 55,257. They are mainly concentrated in Jharigam block of Nabarangpur district. The word ‘Kandha’ is derived from the Telugu word Konda which means a small hill as well as the hill men. On the basis of socio cultural characteristics, the Kandha may be divided into several sections such as Desia Kondha, Dongaria Kondha, Kutia Kondha, Sitha Kondha, Buda Kondha, Pengo Kondha, Malua Kondha and Nanguli Kondha. The Desia Kondhas of Nabarangpur district practice settled cultivation. In addition to cultivation they heavily depend upon collection of forest products and food gathering for their living. Kondhas are famous in history for their meriah sacrifice. The two festivals, such as Chitra Parab observed before sowing Paddy and other millets and Meriah or Kedu festival observed in the month of February – March are the most important and are observed with much Pump and Ceremony. Human sacrifice in the past was later substituted by buffalo and continues even now.